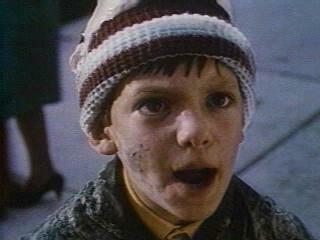 Lukas Haas in the 1988 scary movie, Lady in White. Lukas Haas is my "little" brother's age, so growing up it felt wrong to think he was cute. He had these adorable oversized big ears, dark chocolate eyes and an awesome bowl haircut. Now that we're adults, I can admit that I've always fancied his freaky good looks. Freaky meaning he isn't smokin' hot like his old pal Leonardo Dicaprio, he's more off-beat cute. Girls know what this means. a child star in Witness. 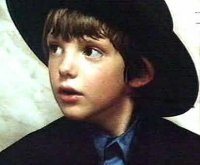 I sort of stopped following Lukas Haas' career, although I managed to catch all of his films from Alan & Naomi to Mars Attacks to Brick to Johns -- this kid has been in like a million movies! A while back, I was watching Death Cab for Cutie videos on YouTube and quickly realized Lukas Haas is the "other guy" in their "Cath" video. 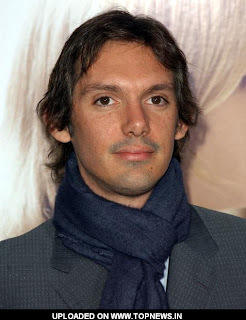 Lukas Haas has also appeared in several different music videos and has been busy making his own music as well. In 1988, Lukas starred in one of those movies that scared the hell out of me. It took place in the 1960s and was called Lady in White. Anyone remember this film? It also featured my other fave kid star, Jason Presson. Lukas Haas today, indie rocker. He was born in Texas, his father was born in Germany. He's been in more than 36 films -- at 7 he appeared in Testament and then in Witness at age 8. Music is a big part of his life, he plays piano, drums and has an amazing voice. In addition to Death Cab for Cutie's "Cath", Haas has appeared in videos for My Chemical Romance, OutKast and more. His next film, Contraband stars Mark Wahlberg. He's always been adorable. Lady in White was a great movie. And, every time I hear that song, I think of it. Good stuff. Can we talk more about Mars Attacks now? AAK! AAK AAK AAK! AAAAK!! Loved Lady in White and Witness! Also, Leap of Faith and The Story of Ryan White. Margie - totally! I honestly need to watch this movie again, I think I've only seen it once in the theater. Lost - Same with Mars Attacks, saw it in the theater! Ms. A - I know, he's been in soooo many different films, TV, etc. I just couldn't name them all. LOVE this movie!! Then and now!! I think he was in Mars Attack if I remember correctly! I know of his music, but wasn't really aware of him as an actor. Saw a few of the movies you listed, but never put two and two together. I'm old 'cause I remember seeing that movie in the theater and I was older than him. DARN!!! He has grown into a handsome young man. I'm glad he got a role in a movie with Wahlberg. I remember him in "Witness" but that's about it. Wow...can't believe that movie is THAT old already! I feel old. Bah. Mars Attacks was a classic. He's always been cute but now he looks a little weird...something about his eyes?